It was Sunday, and although we had the entire day free, neither of us was feeling particularly creative. We hadn’t made pork in forever, so I looked deep into the freezer and found a 2-lb. pork loin. I went to the basement for some inspiration from our bookshelves of non-perishables. My mother loves to order from Pampered Chef, Tastefully Simple, and those kinds of things, but she doesn’t cook much, so we seem to end up with a lot of interesting sauces, condiments and marinades. One that caught my eye was Tastefully Simple’s “Sweet and Sassy Mustard Sauce,” since mustard and pork are so great together. The ingredients to this sauce include sugar, distilled vinegar, stone-ground mustard, brown sugar, white wine, the elusive “spices,” maple granules, and garlic. All good with pork, right? My addition? 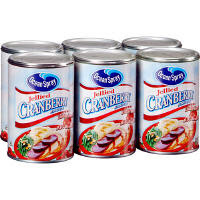 A can of jellied cranberry sauce. Chris got the slow-cooker while I cut the pork in half. We threw the pork in and added the entire can of cranberry sauce and the whole bottle of mustard sauce. We gave it a stir and let it do its thing for about 4 hours. Besides the fact that the house smelled fabulous all day, that night we had a wonderfully easy pork dinner. The pork was juicy and fork-tender, and the sauce was both tangy and sweet. Thanks, Tastefully Simple and Ocean Spray!